“C’Heart Blanche” is the only way to treat your darling on Valentine’s Day. At first blush, that may not seem to take you in the direction of Germantown Avenue (at Gowen) in Mt. Airy. But an olfactory oasis occurs at the historic and charming Cresheim Cottage, built on land purchased from William Penn in 1683. The building has housed, over the last centuries, says its restaurant owner, “butchers, weavers, stocking knitters, hatters, furriers, powder makers, printers, victullars,” and most importantly to lawyers: lawyers. The atmosphere is neoteric colonial in which a high original deeply set fireplace presides. Coyly colored glass bottles glow in reach of its mantle. 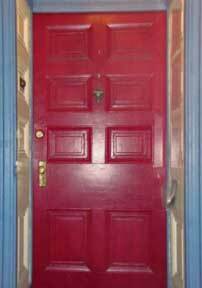 The entrances door is Johnny Tremain red. You enter upon a dazzling rectangular bar area above which dangle wine and champagne glasses. Cozy dining rooms appear in all directions, laden with candled lanterns in latticed windows. Every table is covered in white linen, topped with a swath of coloring paper and a small silver jug full of assorted Crayola crayons. Immediately draw a heart, add your initials, the initials of your lover and an arrow pointing to the latter. You may not be Cupid, but on Valentine’s Day you need not be stupid. The next romantic maneuver is to order dessert first. “To start,” you advise your waitperson while holding your love’s hand, and gazing only into the eyes leveled at you across the table, “we’ll have Key Lime Pie, Pumpkin Pie, Pudding, and Berries Poached in Port Wine.” Purse your mouth slowly at every word beginning with “P.” Then add, after a heavy sigh,… “And Champagne!” The person you adore is now giggling, blushing and caressing your fingers. Let go when the pies and berries arrive. You’ll want free hands. The Cottage’s slice of pumpkin pie ($6) is heavy, thick with caramel sauce, and spicy. It’s “mouthfeel” is luxurious with aftertastes, leaving layers of crusted tidbits upon one’s tongue. Your two lips insist that you fork and wrangle another piece between them as they quiver in anticipation, before the first molten brown flavors disappear. 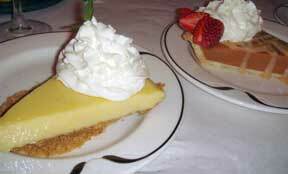 The key lime concoction ($6) is light and redolent of lime. A silken smarmy sliver is topped with whipped sweet cream. Its underlayment of graham crackers complements the superb syllabub above. I hope not to anger the reader by omitting to mention more about the ribald risotto-riddled pudding and/or the wickedly lickedly-lemon-sorbet poached berries; but only teething is believing. They are the epitome of edible Valentine Day cards. 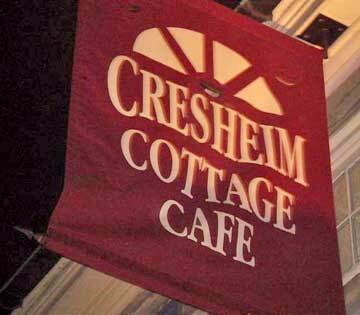 Cresheim’s owner-chef, Donna Fitzgerald Robb is an alumna of the forces behind the kitchen at Judy’s Café, the now closed 3rd and Bainbridge neighborhood haven for family-friendly comfort food, and a welcoming culinary beacon for gay and lesbian patrons. The carry-over of comfort classics and pleased patronage is unmistakable. Split a “Croque Monsieur” ($12) to whet appetites. Gruyere cheese oozes lazily between a thin filet of naturally smoked salmon and glistening caviar. All is draped in warm toast. The cheese swirls forward as the sandwich is squeezed to fit a bite upon one’s tongue. The flaking pink salmon creates a smokiness and softness as your cheeks expand, and the black caviar eggs explode in salty grinding of jaws. But save some energy for the entrées. 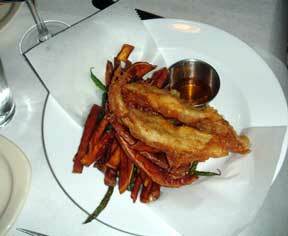 “Fish & Chips” ($17), blatantly beer and bread-battered tilapia, are surrounded by sweet potato fries. The ingredients can bathe by dipping their bodies in chili-honey sauce. The fish is sublimely fresh. Its golden outer layer crackles upon your palate. The fries are especially scented to add a sweet refrain to their crunch. 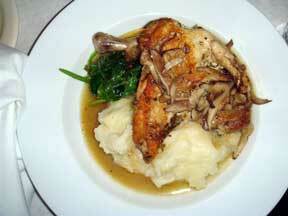 Or order the Cottage’s chicken or duck “Neighborhood Specials.” Roasted “Half Chicken” ($17) arrives asleep, atop garlic mashed potatoes and spinach in a shitake mushroom jus. The chicken is nestled so cozy that you hate to disturb it. You won’t regret having prodded awake and chewed the free-range chicken’s warm pieces. They are swallowed with their bedmates in a pillowed gulp. 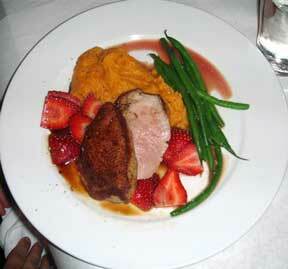 The “Duck Breast” ($21) is mounted upon sweet potato puree, haricot verts with wine syrup and emboldened by a rash of fresh strawberries. Served half skin side up, half in the skinny, the breasts glisten in alternating mauve and pink hues. Morsels are rich and thickly textured. The accompanying strawberries catapult all your taste buds. The verts are veritably verdant. 2008’s Valentine Day’s prix fixe ($35) Menu shall be displayed shortly at www.cresheimcottage.com, and should include all of the luscious flavors of local farmers’ best foodstuffs, most favorably enhanced by a cook so comfortable with naturally fine ingredients, that your comfort is simply contagious. There may even be some loving leeway given for you and yours to order dessert first. This Leap Year, on the last day of February, the restaurant under Ms. Robb’s tutelage, shall also celebrate its fourth anniversary.